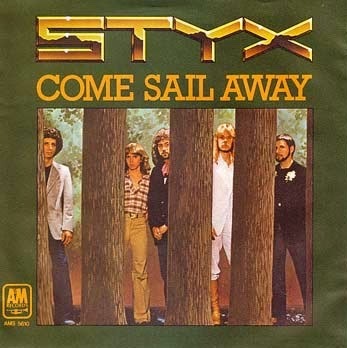 I was recently in the gym talking, coincidentally, to a guy named Jim, and the Styx song Come Sail Away played on the radio. Thinking about that song, it certainly hasn’t been a great, influential part of my life that inspired or comforted me, or even has great sentimental value. But as I told my friend Jim, it’s interesting how my mode of listening to that song has changed over the years. I first heard Come Sail Away in elementary school on the little AM transistor radio I used to hang on my wrist. I liked the song because it mentioned starships, and I was really into anything that had anything to do with space. I was so cool because I knew lyrics to a pop song. Not long after that, I recall going to a friend’s house and listening to Come Sail Away on his dad’s old 8-track tape player. Actually it wasn’t old at the time, and it was really awesome how some songs would suddenly fade out half-way through the music, then fade back in when it switched tracks. It was state of the art. When I reached junior high school age, another friend had the song on a 45 record, which we listened to often. The good thing about records was how they’d get damaged, then skip and keep playing the same part of the song over and over. Few kids were as hip as us. But things got even hipper. In high school, I attended an outing with a youth group where we took a bus to another city. Someone on the bus had the whole Styx Grand Illusion album on a cassette tape and played it repeatedly on his boom box while we all sang along. We had to wait after each playing as he rewound the tape, which was a good thing because it allowed us to catch our breath. Then I took a breather from the song for a while. Come Sail Away sort of faded out of my life for about ten years until I bought it on CD as a Christmas present for my oldest daughter. I was happy that she liked a song that I liked when I was young. We’d listen to it together and we’d finally reached the epitome of the digital age. Several more years passed and my two older kids, who’d grown into teenagers themselves by then, joined a youth group outing just like the one I’d done so many years earlier. This time I was the driver in our 8-passenger Land Cruiser. My son pulled out his iPod Shuffle and we plugged it into the stereo via the cassette tape adapter. And once again, all eight passengers—two generations—sang along to the same old song. Come Sail Away had sailed full circle. But there was still wind in its sails. As I sit here and write this, Come Sail Away is playing on the same stereo that we used to listen to the CD when my daughter was younger. But this time, my phone is streaming the song from Spotify and it’s connected to the stereo via wi-fi. And my kids—the older and the younger ones— are singing along. So where do we sail from here? I’m hoping we can stream music directly into our brain from a satellite. Then we can just think of a song and it’ll play. Perhaps this “song of hope” does have great sentimental value after all, as I think of childhood friends and the dreams we had.